After working full-time for a few years, I started to get the urge to go back to school. I wanted to take my career to the next level and expand my horizons. Getting a master's degree was always something I wanted to do, but it was still a big, scary decision. One of my biggest concerns was money -- and rightfully so! Going back to school can be incredibly expensive. 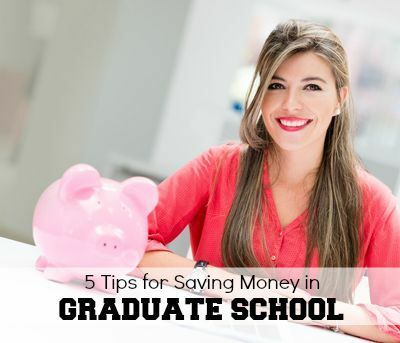 But I learned that there are some key ways that you can save money and rock your budget as a student. Here's how. One of the easiest and best ways you can save money when going back to school is by taking advantage of student discounts. Students can typically get a discount at bookstores, movie theaters, some clothing shops, and more! If you're unsure whether a retailer or restaurant offers a student discount, just ask! Being able to take advantage of a student discount is limited to when you are in school, so enjoy it while you can. Going back to school can only mean one thing: you're going to be buying a lot of books. Between several classes it can quickly eat up a huge chunk of your budget. Instead of buying new textbooks, consider renting your textbooks (yes, renting) or buying used. Most of the time you can get the same materials for a fraction of the price. The key here is being organized. Have your book list ready ahead of time so you can be certain the materials are available (and give them enough time to ship if needed!). You may be unsure of this one -- especially if you're an older student. But by attending free campus events you're maximizing the money you invest in your degree -- a portion of your tuition is used to support "student life", after all. Schools typically have free events like festivals, lectures, art gallery openings and parties. When I was in graduate school, I went to at least one free event each week. I would save money by getting free food, drink and entertainment -- and combine that with a little networking! Think outside the box -- and look for events you may not even consider. Making connections now might even help you with your future job search. If you're going back to school -- especially if you are returning after a few years in the workforce -- you're probably used to a certain lifestyle. Having your own apartment and going out a few times a week may be a given for you -- but to be financially solvent you're going to need to adjust to a new way of living. As a student, you're likely not working very much (or not working at all). Even if you are working, you're probably not making what you used to. In order to live within your means, you may need to scale back and get a roommate, go out less, and temporarily remove some additional luxuries from your budget. It may be difficult, but the goal is to eliminate the gap between what you make and what you spend. Remember, this will only be temporary, but it's key to adjust your budget to reflect your new student status. Cutting back now will ensure you're in better shape when you graduate. If you're taking on student loans to finance your education, make sure you use them wisely. Student loans should be used for tuition, books, and school related items -- not for furniture or vacations (as tempting as it may be). Beyond that, make an effort to only borrow what you need. If you can, make interest-only payments on your student loans while in school. Doing so can save you money in the long run. In addition, consider getting a part-time job to help cover some of your living costs. I worked throughout graduate school and was able to pay for most of my rent, utility and grocery bills. This helped me borrow only what I needed and not take additional loans. It was a hectic schedule, but looking back from the other side it's the best decision I made. Getting my Master's Degree was a great decision for me, and with a little savvy planning I was able to lower my overall debt load and come out in pretty good financial shape. Still on the fence as to whether you should go back to school? Make sure to ask yourself these five questions first. Melanie Lockert, the author of this piece for GoGirl Finance, blogs about breaking up with debt at DearDebt.com.